In most Indian homes, there is one room that is either non-existent, overdone with little thought or, is treated as just another room. Non-existent because of space constraints, or a lack of awareness about its significance, or overdone because the parents are excited and go overboard. Here's why your child needs a room, and how you can strike a balance in its construction and design. The parents' sense of attachment and their understanding of the child's need for independence are deciding factors in whether or not the child has a room to itself, says R. Manoj, clinical psychologist. “Up to the age of five, it is good for the child to be with the parents, in their room. A room or a dedicated space in the house for the child could be given between six to 11 years age, because that is when their sense of independence develops. Beyond 11 years, it is better to give the child his/ her own room, but with enough access for monitoring by parents,” he explains. Children move fast, grow faster and change preferences the fastest. Therefore, the room that you design and furnish for your child must be capable of adapting to the growing child within its walls. Chief architect and planner of Kharche & Associates, Prashanth Kharche feels parents should think minimalistic. “I keep telling my clients that by the time the room is ready, their child might have lost the fancy for that theme they've put together for him or her,” he says. Since neither Indians nor Indian constructions are renovation-friendly, it would make sense to refrain from wallpapering, glow paints on ceilings and rigid themes, he adds. 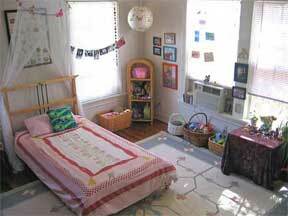 Pictures of inspirational kids rooms. ... Tags: childrens room, kids room ... Other related interior design ideas you might like. Decorate kids rooms : Design your Child's Room : Children's Room Decor : Decorating your Kid's Room : Design your Child's Playroom. interior dezine.com, Children's room decorating ideas. Some tips on how to work with children to decorate their spaces and create fun ideas. Decorating Childrens Rooms: Important Design Tips! When decorating childrens rooms you must consider these frequently over-looked elements that will make it child-friendly. TLC Home "How to Design Children's Rooms"
Learn how to design children's rooms with the tips in this helpful article. You' ll find out about color schemes, furniture transformations, and more. An own room is very important for children. It's the place where they grow, study, play, store their things and sleep.